I nearly missed this one buried in the Guide. 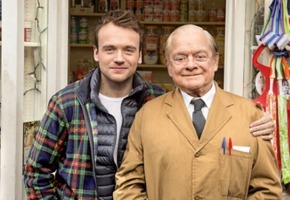 Tonight ABC1 screens the 2013 special for UK sitcom Open All Hours. The original series ran for 26 episodes in four series from 1973 to 1985, featuring Ronnie Barker and David Jason. This 40th Anniversary Special aired in the UK on Boxing Day, featuring David Jason and James Baxter. A one-off special of Roy Clarke’s popular comedy. Granville is no longer the dogsbody, having inherited the business from his miserly Uncle Albert Arkwright. The BBC later announced a further 6 episodes would air later this year. Loved the original series and was happy it was replayed on 72 recently. Watched this but have to say it was pretty lame. Only good thing was seeing a few of the orginalsincluding Nurse Gladys Emmanuel. 40 years! I feel old. My bestie and I thank you for the heads up DK….